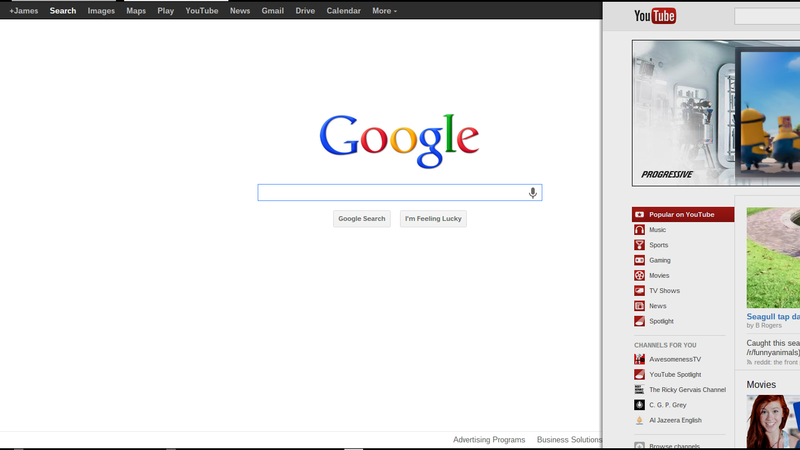 More fancy mouse controls for Chrome OS! In today’s Chromebook Tip of the Day you will learn a quick tip that will accelerate the speed in which you navigate the web on your Chromebook! Overscroll History Navigation flag under chrome://flags allows you to jump forward and backward in a tabs history simply by utilizing a 2 finger horizontal swiping motion on your trackpad. No need to move the mouse up to that pesky browser back or forward button. The screenshot above shows what the animation looks like when you use it. I was scrolling back from Youtube to my Google Search page. Follow this simple how to on enabling the Overscroll History Navigation flag on your Chromebook. What are your favorite flags in chrome? Let us know in the comments section down below. This entry was posted in Chromebook, How To's, Software Tips, Tip of the Day, Tips and Tricks and tagged Chrome Flags, chromebook, chromebook tips, Clients, google, Google Chrome, Google Chrome OS, Google Search, tips and tricks, Web browser, Youtube by James Arnett. Bookmark the permalink. I just unboxed my Samsung Chromebook. I found your site and think it’s great to have a tip per day. I think Chromebooks are the future for seniors and even kids in school. I think your website is Chromelicious. Thanks. I am glad that you like it. Let me know if you need any help. Thanks for your response. I love technology. Are you just a chromebook guy? No I am not. Due to being a Computer Engineering student I now also have a Macbook Pro. I can’t find the overscroll flag. Is it not for canadian users? Hmmm… I am not sure on that one. Let me do some digging. What version are you running? Also what are your specs? Might be related to that as well. I don’t think these flags are geography lock. I believe this is one of the newer feature in the Version 28 (beta channel) or even Version 29 (developer channel). You can check your Chrome OS version by going into setting > help. Not only you can see your current version, but you can also choose which channel to be run on your chromebook. There might be a bug or two in the dev channel, but I’m sure it won’t affect your daily use. Especially you get to live on the verge of Chrome OS. Hope this could help you out, and stay tuned with this blog for more tips and tricks about your chromebook!! Do you guys by any chance have a problem with your samsung chromebooks where youtube videos will stutter and glitch when they’re not your current tab? I am glad that this helped you out! Unfortunately this is common on Chrome OS. The reason that this occurs is Chrome OS assign’s different priorities to things on the system to better utilize processing power for things you are using versus things you are not. Therefore background pages drop in priority. Are you listening to music on Youtube? May I suggest using Google Music or maybe Spotify? I have posts on using both of these. Yeah I actually use hype machine for music! I just like to have my video buffer in the background before I watch it. Is strange because Netflix and and other even heavier video technologies work perfectly fine in the background, it’s only YouTube that glitches :/… Really weird considering it’s a Google laptop! Yeah that is weird. It might have something to do with the flashplayer chrome uses. You should try out the HTML5 player. It is currently in trial so you have to opt into it. actually enabling vp8 experimental codec in chrome flags helped out! Glad you write something about flags!! This one along with the three finger horizontal (change tab) are really useful and I used it all the time…this makes Pixel touchpad one of the best in class. Btw, just a little suggestion. Maybe you should start a spreadsheet on G Drive, posted it on the blog, for us to collaborate, share and summarize what all the flags are about. that is a great idea. I will work on that! Be sure to share it, so that some of us might be able to help you out a bit.